14 May 2015. Win free tickets to Big Red Bash; Headlamps 25% Off; New Edition Release Roads & Tracks WA 12th Edition & the Reprinted 3rd Edition Camping guide to WA - Boiling Billy; 2015 Road Closures Parks Victoria; Tip of the Week - Where to Get Technical Help; Super Specials on Camping Stove Windscreen, Collyn Rivers Campervan & Motorhome Book, & Simpson & Day Field Guide to Birds of Australia. Refer a Friend - if they buy Membership Personal or Lifetime and include your name in their order comment field then both you and they will go in the draw. This competition is only valid for Membership purchases made between 11th May - 1st June. The two lucky winners will be announced in our newsletter on 3rd June 2015. When you seek assistance with a technical query about site usage or setting up EOTrackMe, EOTopo, EOzi on your device/computer, the best place to ask for help is the ExplorOz Forum. Also keep in mind that all the documentation for our products is available online in the relevant sections. Try the site search or site menu. Once again, we've sourced an amazing deal exclusively for ExplorOzers. 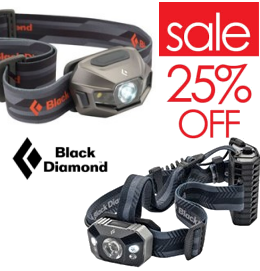 We currently have a very limited number of these high-quality Black Diamond headlamps massively reduced by 25%. Two models are available: one features hybrid power options either rechargeable (via USB) or standard AAA aklaline batteries. The other is a professional level headlamp with a massive 200 lumen output, waterproof construction and batteries-in-the-back design. 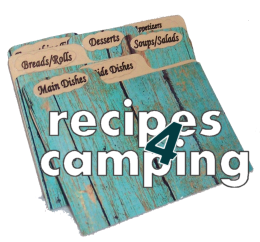 The ExplorOz recipe collection is continuing to grow and we hope you are enjoying the great ideas shared by our community of expert bush cooks. This month our theme ingredient is Mince and we encourage you to share your favourite recipes to this category. Each entry submitted in the month of May will go into the random draw to win the Equip First Aid Pro 1 Kit, worth $111. Are you looking for the latest track conditions and news? It's all here in the Road Alerts section. This week we've also added a new travel tip blog with the confirmation of the 2015 Winter Road Closures in Parks Victoria. Thanks to Member - Mike (SA) for these updates. Don't forget to add your comments to these track reports after you travel to add relevant anecdotal information that might help others. Operating ExplorOz.com requires staff and infrastructure, which requires a business operation to pay for it. Whilst you have the option to use the site for free, we can't operate the site for free! buying the EOTopo mapset; buying Personal Membership or Business Membership; buying Classified ads; buying from our online shop all continue to covering some of our operating costs. by respecting the Forum Rules and Moderation Policy and respecting the volunteer Moderators and treating them fairly. All we strive to do is keep ExplorOz a great online community that is run by travellers for travellers but it requires the commitment of the majority not the minority. 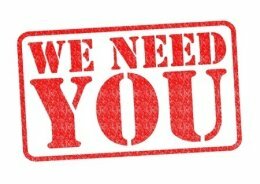 Please consider any of the above ways that you can get more involved to help support ExplorOz.